This is by far one of my favourite comfort foods and a traditional english sunday dinner dish. 1. Sieve your flour and baking powder into your jug and season with salt and pepper. 2. Make a well in the centre and crack both your eggs. 3. Using your wooden spoon slowly combine the eggs with the flour until it makes a thick dough. 4. Once combined, slowly pour the milk in and stir until it resembles the consistency of double cream. 5. Cover and leave for 30 minutes, or a few hours if your making in advance. 6. Preheat your oven to 200C (180C for fan assisted) while you heat up your large frying pan on the stove. 7. Brown your sausages in the pan and then place on a bit of kitchen roll to soak up all that fat! 7. Place your olive oil or vegetable fat in your roasting dish and place in the oven for 5 minutes to get really hot and hazy. 8. Once your dish is ready, quickly place your sausages in the middle, spreading them evenly and pour your batter in between and around the sausages. 9. Place the dish straight back in the oven and cook for 30-35 minutes. 10. 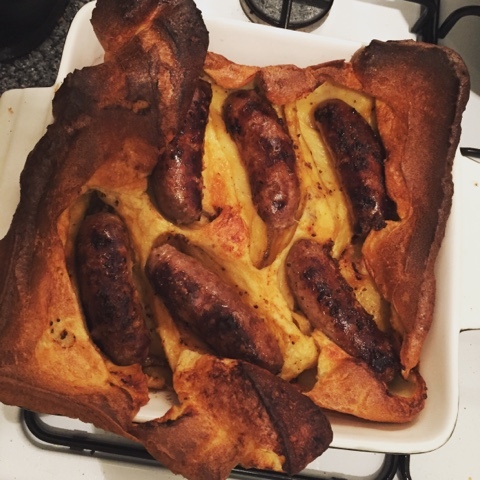 DO NOT OPEN THE OVEN DOOR, or your toad in the hole will deflate and collapse looking like a sad wrinkly face. But keep an eye on it and at 30 minutes, if it starts going a bit too brown cover with kitchen foil for the last 5 minutes. 11. Serve with garden peas and onion gravy. I'm almost certain that the following occasion you sort out will be a win. It just thank you to have a decent procedure that will have the capacity to reach however many individuals as could reasonably be expected. I trust that you have great goals. College paper writing service is one of the major support for student to complete their assignment, visit to get more info.